Every so often I stray from my home state. Most recently, I visited the Oregon Coast, which I must admit has some appealing qualities that our coast does not, including more accessible beaches and gigantic rock formations in the water (you’ve probably heard of Haystack Rock). This time I stayed overnight in Pacific City, a tiny coastal town, so I’d like to share the possibilities it offers with you. Beach at Pacific City, Oregon. I stayed at the Inn at Cape Kiwanda, which is directly across from the beach and a few steps from a very good eatery, the award-winning Pelican Pub & Brewery. My husband and I had been to Pacific City before, but never stayed overnight because the accommodations looked expensive from the exterior. As it turns out, they are not. Rooms at the Inn start at $139. All of the guest rooms have ocean views from a private, covered balcony, gas fireplaces, microwaves, small refrigerators and high speed wireless Internet. Really, what else do you need? If you want to bring your “best friend,” dogs love the beaches on the Coast and the Inn is pet-friendly. As the iconic single’s ad says, “you can take a long walk on the beach,” watch sunrises and sunsets, look for glass balls and watch the waves crash. 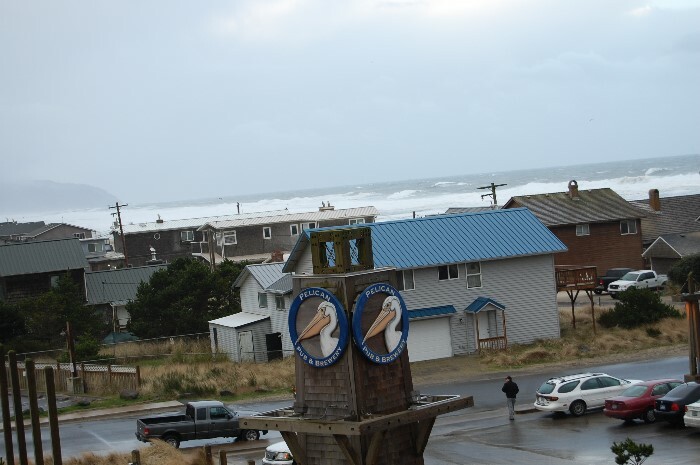 Pelican Pub & Brewery and another Haystack Rock. If you’ve come to storm watch, you might also want to read a good book and create a scrapbook of memories. Kids can search for agates in the sand, feed bread to the seagulls, go horseback riding and eat s’mores on the beach. And then you can get a good night’s sleep, slumbering with ocean noises in the background and find even more activities for the next day. 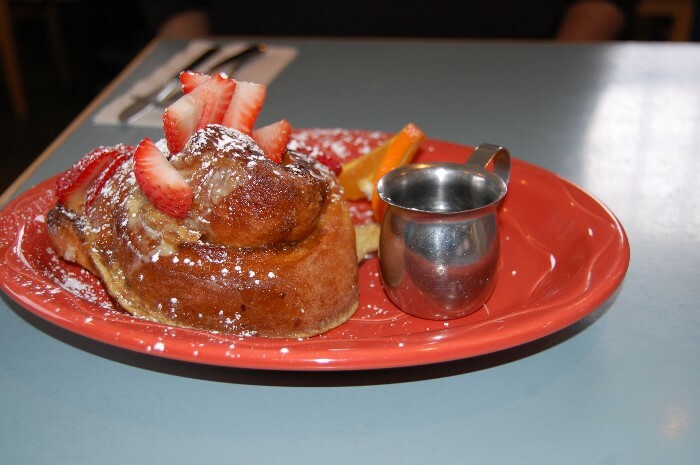 A good breakfast spot is The Grateful Bread, which is a full-service restaurant and a bakery. Cinnamon roll french toast at The Grateful Bread. Tip: In Oregon, an employee always pumps your gas for you. There are no self-serve gas stations. What is your favorite coast and why? 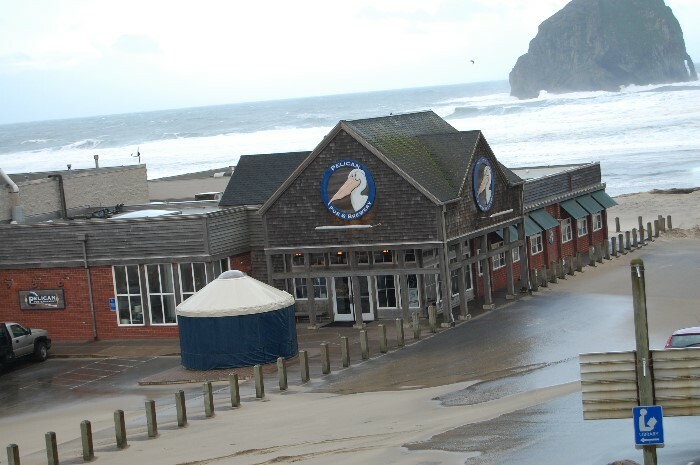 This entry was posted in Beaches, Dog-friendly, Family Fun, Hotels and Other Lodging, Restaurants, Towns and tagged Haystack Rock, Inn at Cape Kiwanda, Oregon, Oregon Coast, Pacific City, Pelican Pub & Brewery, The Grateful Bread on March 9, 2012 by admin.